major Fortune 500 companies announcing huge sustainability efforts or big PR firms declaring their workplaces will be carbon neutral by 2009, it seems like everyone’s jumping on the environmental sensitivity bandwagon. And, that’s cool. It’s a noble effort to be sure. But, is it a futile one as well? Auden Schendler, who Time Magazine anointed just last year as a ‘climate crusader’ thinks so. He laments in a current BusinessWeek profile, "How do you really green your company? It’s almost f***ing impossible." It seems that no matter what any of us do, it will have very little, if any, meaningful impact on reducing global carbon emissions. Does that mean we shouldn’t try? Or course not. But, the ‘doing well by doing right’ corporate mantra du jour, is apparently just that in many cases: a mantra du jour. According to BusinessWeek, some companies are already abandoning their green efforts because they don’t provide an immediate return. CEOs, pressured by Wall Street to produce quarter-to-quarter results, simply can’t wait seven years to show an ROI (which is understandable). though, isn’t the corporate double-speak. That happens all the time. to how my playing ‘guess’ at a urinal slows global warming. 2.75 billion Chinese who could care less? This entry was posted in Current Affairs, Environmental issues, Social Responsibility and tagged Auden Schendler, BusinessWeek, Fortune 500, going green, hybrid cars, sustainability by RepMan. Bookmark the permalink. That’s all well and fine, Ann. But, I still resent zealots who turn the men’s room lights off. The point of the BizWeek article is that buying carbon credits or renewable energy certificates isn’t the panacea that a lot of companies hoped for. Like wealthy Christians in the Middle Ages who thought they could do as they pleased on Earth and still get to heaven by buying papal indulgences, a lot of misinformed companies hoped they could assuage guilty consciences and make themselves look good by going carbon neutral through carbon credits. But while credits can contribute in a small way to the creation of renewable energy, they do NOTHING to reduce a company’s carbon footprint. So the effect on reducing GHGs in the atmosphere, at least over the short term, is nil. We are certainly dependent on companies to change their ways if we are to come out of this, literally, alive. The good news is that even institutional shareholders will be holding their portfolio companies more responsible for their environmental practices. And we know from history that when you hit companies where it hurts most — in the wallet — we begin to see real change. In the meantime, even if you do just one thing a week — reuse a bag, switch a light bulb, refuse takeaway foods that come in Styrofoam — you really will make a difference. I agree with the premise of the BW article that it’s very difficult to achieve ROI from going green, especially for a large company. But I also agree that apathy among people like us is detrimental to the cause of managing climate change. But, here’s the bottom line: Whether they like it or not, companies are going to be forced to reduce their carbon emissions sooner or later because of pending government regulation and the deterioration of the planet’s health. The smart ones will figure out how to begin the process now so they can do it on their own terms. The laggards will stall and find themselves with a slew of regulations thrust upon them when govt. is finally forced to act. So, it really shouldn’t matter if going green is profitable or if it can demonstrate clear ROI. Climate change is a fact of life and we’re all going to be forced to sacrifice come hell or high water. Over here ‘Green Meanies’ have been referred to as ‘enviro-fascists’. I am concerned that this blog will just increase apathy to what is an important issue. Whilst I am worried by the attitude of some big business towards the climate, and people who make a big deal about being green irritate me, it doesn’t mean that we shouldn’t try to do our own things. One of the biggest issues that will help push green ideas over the top, in my opinion, is the cost factor. 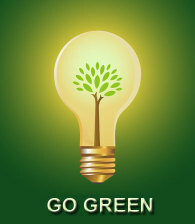 Simply put, thinking green can be much more efficient on your wallet in the long run. Who doesn’t like saving some money from their electricity bill? Furthermore, if companies are to go green to gain a positive reputation (or avoid a negative one), then fair play to them. And there lies the problem, the more people that feel that what they do won’t make ‘much of a difference…’ then it won’t. Perhaps when consumers vote with their feet, directly impacting quarter-to-quarter results, then big businesses will truly embrace ‘going green’ however with consumers attitudes like the above then you’re right – it won’t make ‘much of a difference…’. I really don’t get the point of your blog. Since the corporate fat cats are throwing in the towel, does that mean we should all just give up? I think not. In fact, it’s all the more reason to push even harder to do your part. And while turning off the lights in the men’s room clearly won’t solve the problem, I’d rather do my part than carelessly waste even more electricity. Your defeatist attitude is exactly why we’re doomed. The planet is warming and there are too many people like you who just don’t care.